Oils are selected which physically and mentally suit the patient best. There are a couple of theories to explain how aromatherapy might work. The first is that you directly absorb the oils through the skin into your bloodstream. The oil can then travel through your body and have an effect on a specific organ or function in your body. Aromatherapy massage not only has powerful physical, emotional and mental effects but it is also a great relaxing and rejuvenating experience. The benefits of aromatherapy massage affect a wide range of health conditions. 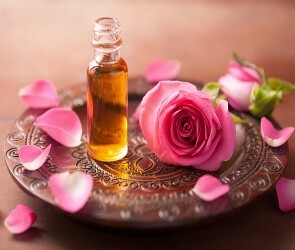 Aromatherapy is a type of massage that uses essential oils which are aimed at improving a person’s health and mood. It is believed that the inhalation of essential oils stimulates the part of the brain connected to smell – the olfactory system; a signal is sent to the limbic system of the brain that controls emotions. This causes chemicals to be released which makes the person feel relaxed, calm, or even stimulated. The massage helps to detox the body and creates a deep relaxation. During a treatment, the aromatherapist will either create a blend or use a pre-mixed blend of essential oils depending on the client’s needs.